At Sweet Symphony we’ve embraced the improvements in technology as we feel it can help us hugely in our lessons. Most people – especially the younger generation – are so used to using tablets/apps in everyday life and we feel they open up a world of possibilities in our lessons while keeping things upbeat and fun! We try and incorporate some of our favourite apps into our lessons on a regular basis, but we felt it would help if we listed some of our most commonly used apps, so you can have a go at using them at home, too. This is a firm favourite with Sweet Symphony Piano Students! This is a fantastic app which helps Students improve their sight-reading by playing along with the music which appears onscreen (think “Guitar Hero” but for piano!) 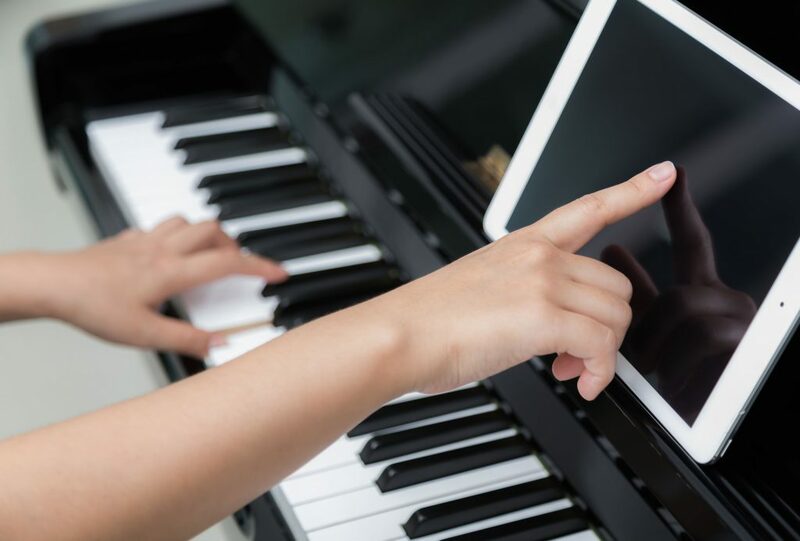 The app cleverly uses the iPad’s microphone to pick up the notes played on the Student’s piano – or you can play using the onscreen piano – and determines whether or not the correct notes were played. At the end of the piece, you’re scored on your note accuracy and rhythm. The app is frequently updated with new and popular songs (one of our favourites has to be the theme for Game of Thrones! ), but that’s not all: Sweet Symphony Students can benefit from a free subscription to Piano Maestro. The Studio pays for a Studio-wide subscription, meaning that if you connect to our account, the app will be free for you as long as you’re a Student at Sweet Symphony. Simply download the app, then when asked if you want to connect to a teacher, type in our email address – studio@sweetsymphony.co.uk – and you’ll be connected to our account. A major plus of being connected is that your progress is synced between your personal iPad and ours in the Studio, so you can pick up exactly where you last left off. Being connected to us also means that your Teacher can incorporate Piano Maestro into your Piano Lessons and actually assign you pieces to complete as part of your homework! Cool, or what?! 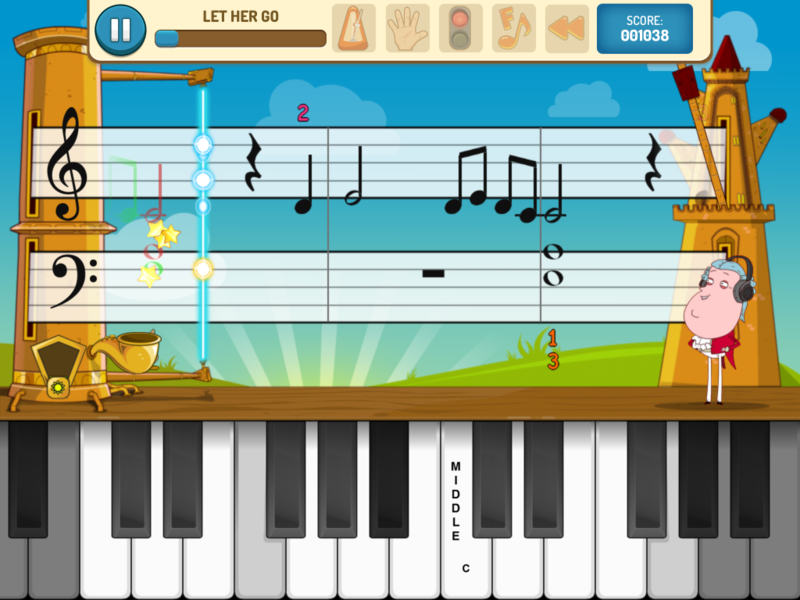 Piano Maestro is regularly updated with the latest songs that Students love to play. Piano Maestro is currently only available for iPads. Download it from the App Store. This is a great app for learning note-names. Perfect for beginner and intermediate Students, choose the correct name for the note that is running across the screen before time runs out! There are plenty of customisable options to tailor the difficulty for you – choose from treble, bass, alto or tenor clef, and select from line-only, space-only, stave-only or the full range of notes. 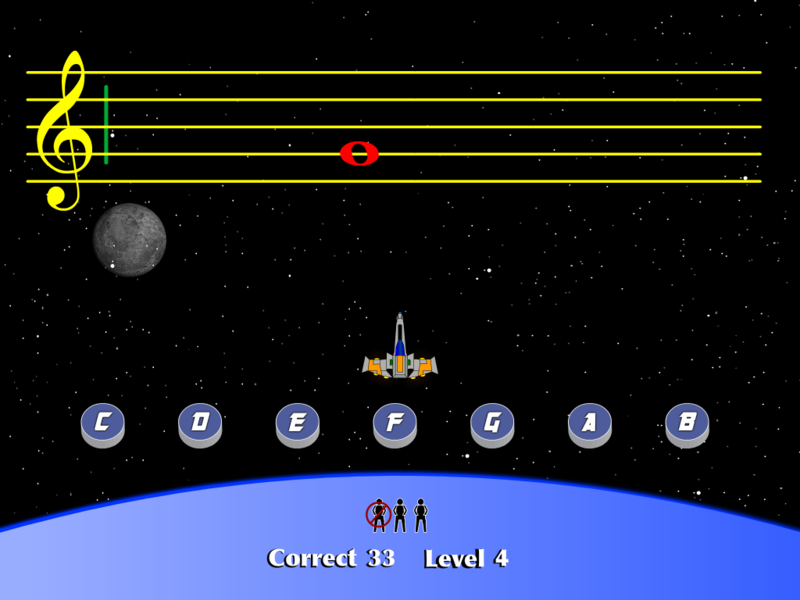 It may seem easy at first, but once you start climbing the levels and the notes get faster, it’s quite tricky!! Have a go yourself and see if you can set a personal best! You’ll have to think quickly – it’s not as easy as it looks! Staff Wars is available for both Android and Apple devices. Download from the App Store or from the Google Play Store. This is one of the newer additions to our collection of apps. Back in the day, exam books would come complete with a CD with recordings of all of the exam pieces on, to help you with your exam preparation. Of course, nowadays CDs are old-school and we’ve moved onto downloads. All of our Trinity Rock & Pop books, and, more recently, the new Trinity Keyboard exam books, come with a code in the back of the book to enable you to download recordings of your exam pieces. These downloads are then played using Soundwise. Have you ever really wanted to play a piece of music, but when you’ve found it you’ve discovered it’s written in too difficult a key? Fear no more! Sheet Music Direct is our go-to website for purchasing sheet music. You can browse online and purchase individual pieces of sheet music, rather than buying a whole book for just one piece of music (we’ve been guilty of this on more than one occasion, but hey, you can never have too much music!) Better yet, you can change the key of the piece before you buy, to ensure it’s written at a level you’ll be able to manage! Simply pop the pieces in your online basket, checkout and your music is ready to print off. 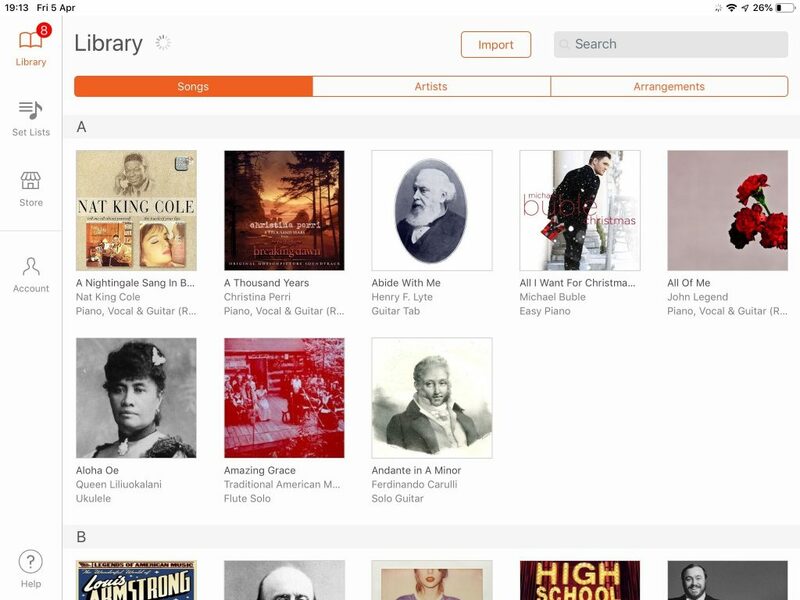 See all of your sheet music purchases in one place and carry them with you wherever you go. The app syncs with your online account, and any pieces of music you’ve purchased through them will appear in your online library, meaning you can have a library of music at your fingertips wherever you are! You can also hear the piece being played through, to give you an idea of what it should sound like – helpful with new pieces you may not be familiar with. Visit Sheet Music Direct here or you can download their app from the App Store. This app is designed to help Students with all areas of Music Theory – admittedly not the most exciting area of Music Lessons for a lot of people, but a necessary one. Tenuto offers sections on intervals, chords, key signatures, scales and loads more. Useful not only for Music Theory Students, areas such as interval recognition also come in handy when preparing for your Aural Tests as part of Music Exams. Tests can be customised according to the ability of the Student, and so this app can be used not only for beginner Students but all the way through the grades as a convenient helper throughout your lessons. Download Tenuto from the App Store. There you have it, then. These are some of the most popular apps used in our lessons at Sweet Symphony. This isn’t an exhaustive list – there are several others we already use, and new ones are always being brought to our attention. If you use any apps you think we would benefit from in our lessons, please let us know – we’d love to give them a whirl! To read our other blog posts and see what else is going on in the Sweet Symphony Studio, click here.